Though the scale and popularity of the medium has changed, the important part hasn&apos;t: Street art and graffiti give voice to the voiceless, often depicting history, tradition or images designed to enlighten, inspire and challenge the communities in which they sit. They exist in conversation with their surroundings, the forces that created them and the citizens that view them. Without permission, city governments consider graffiti vandalism. Graffiti, a style of art marked by images sprayed on city structures with aerosol paints, exploded onto the scene and into urban centers in the 1970s. In recent years, the word "graffiti," taken from the Italian graffito, "to scratch," has since become interchangeable with the term "street art." But the street art of today, like city-government-commissioned murals and sculptures intended to stave off vandals and breathe life back into struggling neighborhoods and urban centers, looks a lot different than the tags of yesteryear. Today&apos;s street art is huge, colorful, museum-quality eye candy loaded with social and political messaging — and entirely on display for anyone to see. While global centers such as Sao Paulo, Paris, Mexico City and even Bethlehem in the West Bank are well-known hubs for the medium&apos;s comeback, incredible public art isn&apos;t limited to foreign shores. Here are 14 U.S. cities that deserve to make it to the top of any art lovers&apos; list, no museum ticket necessary. In 2012, street artist Jetsonorama, also known as Chip Thomas, an impossibly cool medic who once rode a bike from the northern to southernmost points of Africa, founded the Painted Desert Project. The project brings internationally acclaimed artists to the Navajo Nation reservation in Arizona to paint homemade roadside vendors&apos; stands. The hope is that people on their way to the Grand Canyon will take a scenic detour to see the art sprayed by international legends such as Gaia, ROA and Doodles and stay, entranced by the Navajo culture and the desolate expanses of northeastern Arizona. Though Philadelphia was allegedly the birthplace of graffiti, New York is the home to pinnacles of American graffiti and street art as we know it. In 1980s New York, graffiti was a way for those living on the periphery to claim a right to the city. Subway cars, tunnels, facades, all surfaces were fair game. Decades later, the epicenter of street art has moved from Manhattan — though there is some excellent art from international superstars like Maya Hayuk, Os Gemeos, Futura, JR, Kobra and Keith Haring on the island — to the outer boroughs, where works from Banksy, Swoon, Shepard Fairey and more live. Following the hotly contested destruction of street art-haven 5Pointz in Long Island City, Brooklyn (mainly Williamsburg and Bushwick) became the epicenter for street art in New York, courtesy of dense communities of artists — organized groups like the Bushwick Collective included — and tons of huge walls begging to be covered. The history of public art in Detroit spans back more than 100 years, when the visionary painter and social activist Diego Rivera completed a series of nearly 30 panels of frescoes for the Ford Motor Company depicting industry and vitality in the great American city. Detroit has fallen a long way since then, but its art scene is hard at work, showing signs of life in the Motor City. The city&apos;s dilapidated, burned-down and vacant buildings, enduring symbols of the city&apos;s decay, are being reimagined through the eyes and hands of Detroit&apos;s street artists. Perhaps the most famous, the Heidelberg Project, an outdoor art project created in 1986 on Detroit&apos;s east side, transformed entire blocks of worn buildings into a tourist attraction by affixing them with salvaged flotsam and jetsam. In recent years, the Detroit Beautification Project brought in 25 internationally renowned artists — RISK, Sever, Steel and Reyes among them — to blanket the abandoned buildings with murals, making the city more colorful and the surrounding landscape less bleak. Los Angeles is marked by a history of legal and illegal art covering the city. The illegal is mostly tags on the concrete walls alongside the Los Angeles River. The legal, mostly commissioned murals on designated walls, is localized in the L.A. Arts District. Venturing out a little further opens up the wonders of Venice, Calif., too. The Venice Public Art Walls, originally part of the Venice Pavilion built in 1961, are famed street art space. The Los Angeles Street Art Gallery makes it easy to browse online — or locate offline — many of L.A.&apos;s most famous public works. Miami gets a spot on art lists because of the Wynwood neighborhood. With its feel-good sunshine, excellent coffee and 30-foot murals, Wynwood has, according to the Miami Herald, one of the world&apos;s highest concentrations of graffiti art. The Wynwood Walls, an area the local government set aside to be covered by art, feature works from Os Gemeos, Invader, Kenny Scharf, ROA, Dearraindrop, Lady Aiko, Ryan McGinness and more. Outside of Wynwood, murals by artists like Nunca decorate the Art Deco buildings on Miami Beach, adding necessary color to the touristy strip. The city that hosts Art Basel is serious about its art. San Juan is poised to become one of the world&apos;s most influential art hubs, drawing off the creativity of natives like Radames "Juni" Figueroa, who took industrial paint to residential rooftops in the La Perla slums of Old San Juan and covered them in animal prints, brightening up the usually dull-looking cluster of stacked houses. Still, most of San Juan&apos;s street art is concentrated in the hip, young part of town: Santurce, a neighborhood once on the outs but revitalized by grassroots arts organizations and creative projects. The now-vibrant arts district is a walk away from sun-soaked island beaches, and is home to mural after beautiful mural. Art spaces like La Respuesta, which hosts live painting nights where artists paint to music, and festivals like the Santurce es Ley encourage local artists to join in on the fun and keep the art community alive. Those in the know know that Philadelphia is the birthplace of graffiti. And the City of Philadelphia Mural Arts Program, founded in 1984 by muralist Jane Golden to help "combat the City of Brotherly Love&apos;s graffiti problem," works hard to keep that tradition alive and well. Thirty years after its inception, countless artists, students and community leaders, alongside victims of crime and inmates, have contributed to the more than 3,000 murals that adorn the Cradle of Liberty. The often-inspirational imagery is a community effort — for the community, by the community — and covers surfaces everywhere, from abandoned warehouses to historic buildings and small mom-and-pop shops. Source: Courtesy of gammaman, Flickr. The capital of Virginia hasn&apos;t always been a street art hub. But various initiatives designed to "revitalize" Richmond through art want that art to be public. In September, the Greater Richmond Transit Company (GRTC) is partnering with the RVA Street Art Festival, not without controversy, to transform one of its properties with mural sessions, as well as sculpture and mixed media installations. 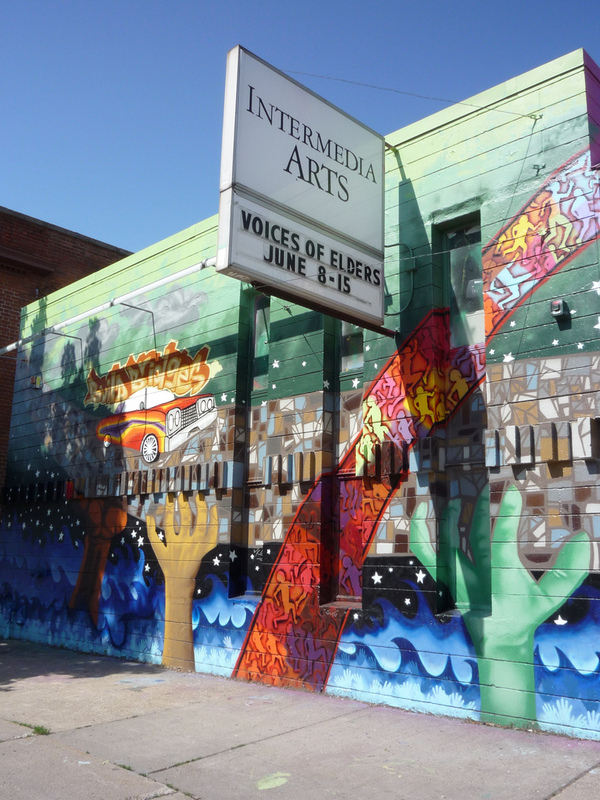 The city art scene owes its biggest debt to the Richmond Mural Project, an annual event working toward creating more 100 murals throughout the city within five years. Thanks to the project, the River City is slowly being covered in art from globally renowned artists like Angry Woebots, Gaia, La Pandilla, Lelo and ROA. There were 45 completed works by the end of 2013. Street artist Gaia is from Baltimore and helps curate the city&apos;s most important street art project, Open Walls Baltimore. The initiative has gained the support of and contributions from artists like MOMO, VHils, Swoon, Nanook, Jaz, Maya Hayuk and more. Gaia has referred to Open Walls Baltimore&apos;s finished work as a "museum for street art," the first openly sanctioned street art exhibition in the city&apos;s history. But commissioned art projects do not always go as planned. In 2013, some of these prominent artists gathered to draw attention not only to beautiful buildings but also to abandoned and vacant properties not designated for muraling that are part of the landscape for lower-income communities. Dubbed "The Slumlord Project," street art is being used to draw attention to boarded-up buildings that landlords ignore. The artists&apos; efforts are paying off all over the city: Property values can rise near street art, as do the moods of the citizens who walk by it everyday. Source: Courtesy of Daniel Lobo, Flickr. Denver, the liberal city of mountains and all kinds of green initiatives, is also home to a some spectacular public art. Colorado Crush, hosted by Denver artist and graffiti icon Dread, repaints a few blocks at the end of every summer to the tinny sounds of cheering cheap beers and shaking aerosol cans. Nearby, the Denver Chalk Art Festival lets artists make the asphalt and concrete beneath their feet into temporary canvases. Other treats in Denver include often-bizarre but always beloved installations and public sculptures, Jonathan Borofsky&apos;s "The Dancers" and Herbert Bayer&apos;s "Articulated Wall" among them. Public art is integral to the landscape of the city, even when that means a giant blue mustang with glowing devil eyes greets you at the airport or the Big Blue Bear peeps on you downtown. For usually dreary (and subzero) Minneapolis, public art in vibrant hues offers a welcome respite from indescribably long winters. The city, often forgotten as a bustling arts hub, boasts more than 550 full-scale murals, almost all of which have been photographed and uploaded to Flickr by resident Mark Allan Peterson, a man on a mission to capture them all. What makes Minneapolis&apos; public art special for most residents is its display of diversity, with cultural figures and traditions distinct to each neighborhood represented in each mural. Didn&apos;t know that Shepard Fairey, Os Gemeos, JR, Vhils and Scribe all put up work in Ohio? Cincinnati, the third-largest city in the Buckeye State, has one of the top street art scenes in the country. Legend has it that after the mayor visited Philadelphia in 2007, he came back with the goal of putting up at least one large-scale piece of art in each of the city&apos;s 52 neighborhoods. Due in large part to Artworks Cincinnati, a nonprofit organization that has created 68 murals since 1996 with the help of more than 3,000 artists and youth, Cincinnati&apos;s walls are covered with works from local and international talent. Hawaii has a street art scene that rivals any on the mainland. Led by POW! WOW!, a nonprofit organization tasked with changing neighborhoods through art, local artists and international superstars alike claim walls for their own to paint larger-than-life murals around the warehouse-laden Kaka&apos;ako district in Honolulu, the capital. An estimated 100 artists have left their mark on the city since 2010. Art is a tool in Atlanta — and an effective one at that. The city, which has one of the nation&apos;s highest foreclosure rates, according to the New York Times, prays that public art projects can save the city from what many consider "urban decay." Living Walls, the City Speaks pairs commissioned artists with a space — a foreclosed house, a building facade, a subway underpass — and gives them free reign. While Atlanta&apos;s street art scene isn&apos;t as well developed as others&apos;, impromptu projects like John Morse&apos;s guerrilla installation of haiku poems around the city, in conjunction with the proliferation of and welcoming attitude toward street art, have attracted the likes of JR, 3TTman and Agostino Iacurci to the Southern city and made it a street art city to watch.